Adrian Peterson didn’t have the type of game he was use to having as of late, but it was his teammates that picked him up Sunday in an upset win over the Texans 23-6. Peterson rushed for 86 yards, falling far short of the 2,000-yard mark, but the Vikings improved to 9-6, and they keep their playoff hopes alive in the victory. Christian Ponder threw a touchdown pass to tight end Kyle Rudolph, and Toby Gerhart added a score and Blair Walsh kicked three field goals in the win for Minnesota. Walsh made a career-long and team record 56-yard field goal with 8:15 left until half to make it 10-3 Minnesota. He set an NFL single-season record with his ninth 50-yard plus field goal. The Vikings added another field goal before the half. Jarius Wright’s 21-yard catch led to a 41-yard Walsh field goal, making it 13-3 with 37 seconds remaining. Walsh connected on another kick on Minnesota’s first possession of the second half. Peterson recorded a 21-yard run on the second play. Wright added a 15- yard catch and a roughing the passer penalty moved the ball to the Houston 22. Walsh made a 39-yard field goal to make it 16-3. 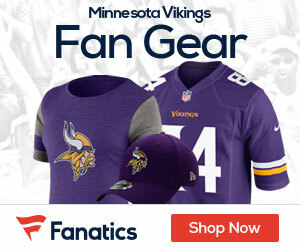 Ponder fumbled while being sacked on the next possession for the Vikings, however, despite taking over at the Minnesota 45, Houston was forced to punt. The Texans seemed poised to score a touchdown late in the third period. Andre Johnson caught passes of 19 and 14 yards before Kevin Walter hauled in a 12- yard pass. On 3rd-and-goal from the one, Houston QB Matt Schaub was sacked for a loss of 14 yards. Houston settled for a 33-yard Graham field goal to cut the gap to 16-6 with 26 seconds to go. Gerhart capped the scoring with a 3-yard rushing touchdown late in the fourth quarter. Peterson had his lowest rushing total since getting 79 yards on October 14th in a loss at Washington, breaking a streak of eight 100-yard games. He has 1,898 this season and needs 208 yards to break the NFL single-season rushing record held by Eric Dickerson. Ponder was 16 of 30 for 174 yards to help the Vikings pile up 345 yards. He finished with seven rushes for 48 yards – 14 more yards rushing than the Texans had. Houston leading rusher Arian Foster had 10 rushes for 15 yards before leaving with about nine minutes left in the third quarter with an irregular heartbeat. The Vikings will look to get to 10-6 next week as they take on the Packers at home. The Vikings should win next week against Green Bay and AP should get his record then in the process.On to the playoffs.Vikings will continue to surprise. I have to hand it to Frazier. I don’t like the way they’ve handled Ponder, but they towed the line. If they go 10-6 and make the play-offs, that will be a very good season. 10 wins is good. Play offs, good. It really matters to the fans to keep winning in December and win road games that count…. Harvin must be feeling a little stupid now. I wonder what his deal is? I love his playing. The most explosive Viking ever, I think. Him and Peterson should be unstoppable. Along with Rudolph….I suspect Harvin is just as explosive emotionally as he is on the field and the coaches aren’t going to let the tail wag the dog. Really, from here it looks like they threw him on IR like a punishment for an out of control child. We’ll see. You have to hand it Speilman. The last drafts have been have worked out great. Much better than Tice era busts. Great win yesterday and the best thing is that it was a complete TEAM win ! I agree with dynalee10. A complete team win is the best kind. I just hate that All Day didn’t get more yards than he did. He’ll really need to step it up next week if he wants to break the record, but if they win and make it to the playoffs, I’ll be one happy viking fan, and it will be nothing less than a remarkable turnaround from the dismal season last year. If that happens, I think that Leslie Frazier should be on the short list for coach of the year. 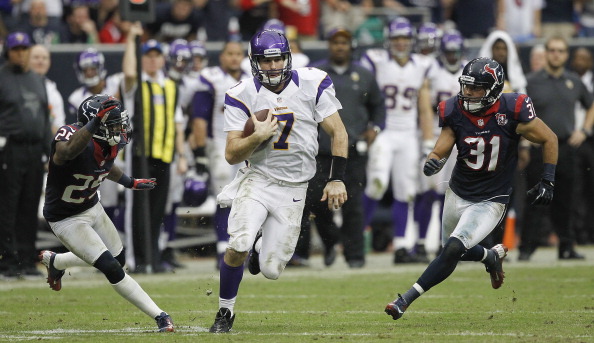 The Vikings NEED to play like they did against the Texans, like it’s a playoff game. Win or go home for the season. Being in the dome should help, IF the home fans make some noise. Get it to the decibel level it gets to in Seattle. Man, those fans are electric, and the Viking fans should be too next Sunday.Come on guys, play with all your heart and soul. Everybody knows you can. Give ’em hell Vikings!! SKOL!!! I know that i will catch alot of flak for this, but i think the vikes should just focus on getting AP the record. If they plan on just winning the game then Ponder would have to throw alot, and we all know how that could turn out. AP wouldn’t get the record and Ponder would hand the game to Green bays defense. Just give AP 50 carries if thats what it takes. This years vikings can’t go far into the playoffs without a QB. So, just focus on the record.